I am so glad it is Thursday. It has been a long week. 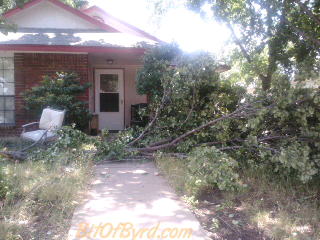 A week or so ago we had a big storm and I lost a branch from my front tree. You might remember the cool storm pictures I posted. 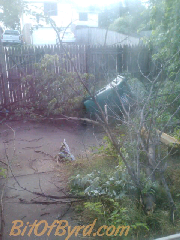 Anyway there was also a large storm this week and I had a large branch fall in the back yard now. On top of the fact that my yard is littered with potential fire wood someone decided they needed the chairs from my patio set more than I did. You can see one of the chairs on the front yard picture. There were two chairs in the front yard and the other two were in the back yard. Yup, they went into my fenced in back yard and took my chairs and my lawn mower and other things. oh well. Police report filled and life goes on. I did add new locks on my shed and back fence and am going to add extra locks to my doors. Have you ever had something get stolen? What did you do in the future to prevent it?